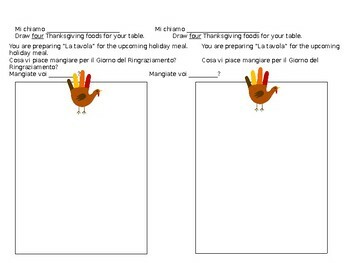 This is a twelve slides PPT to introduce 23 Thanksgiving vocabulary words in Italian, and three follow up activities to reinforce practice. One activity is a pair speaking activity, two are writing activities, and one is cloze reading and writing activity. The pair speaking activity is a "information gap" activity in which students take turns guessing the foods their classmate + family eat or like to eat for Thanksgiving. One slide has "mangiare" and the second "piacere + mangiare". The speaking slides can me modified (to the "tu" or singular form of "piacere" if desired).